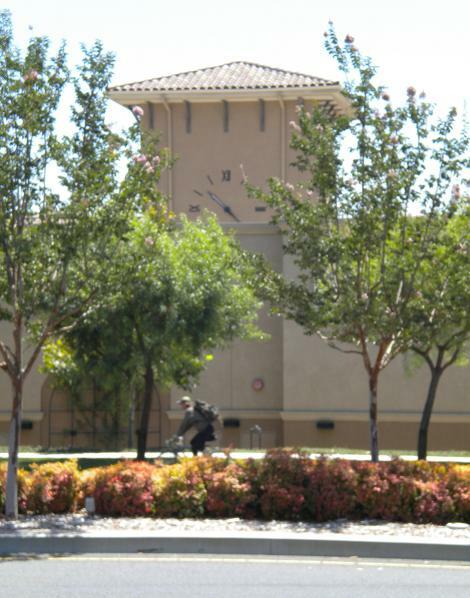 A cell tower disguised as a clock tower is coming to the shopping center at Base Line and Milliken in Rancho Cucamonga, as a recent Bulletin story recounts. (Click on the link at the end of this post to read it.) Some of us wonder if the clock will tell time or be purely decorative. R.C. has a mixed record on this score. 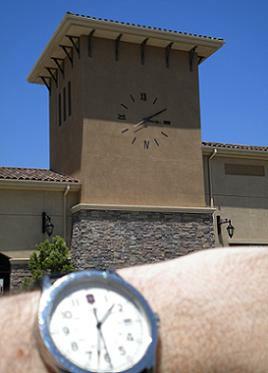 A clock tower at a jewelry store on the Rancho Cucamonga side of Fourth Street across from Ontario Mills has stationary hands. It always appears to be 4:55 p.m., even when it’s, say, 1:53 p.m. 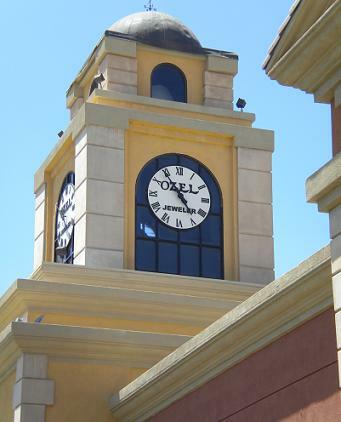 Meanwhile, a clock at the Rancho Cucamonga Town Square shopping center at Foothill and Haven purposely can’t be seen from the street. Planners thought a working clock would be distracting, a rationale I never really understood on a street with billboards. 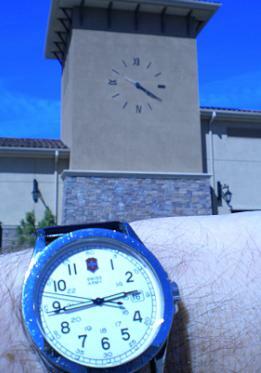 The clockface within the Town Square does work. As illustrated by these two examples, taken in July and March, respectively, the hands move, although the clock is about 90 minutes fast. 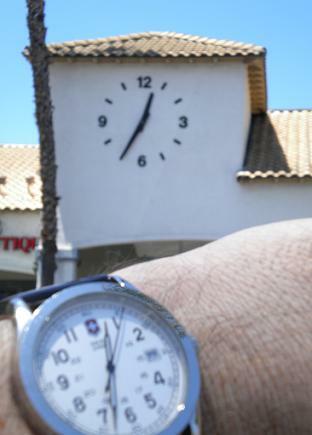 Meanwhile, a clock at the Chaffey Plaza center at Haven and Lemon shockingly fulfills its function 100 percent. Someone should get out there right away and disable it. RANCHO CUCAMONGA – A stroll through Linda Paul’s Terra Vista neighborhood might elicit scenes of modern suburbia – families walking with strollers and children riding bicycles. Mobile phone coverage is sketchy and unpredictable in many corners of the city, including Paul’s neighborhood. One solution, in the form of a clock tower, is planned for the Central Park Plaza Shopping Center on the southeast corner of Base Line and Milliken Avenue. “It’s much nicer than a faux palm,” added Commissioner Ray Wimberly. The 61-foot clock tower will be located on the northwest corner of the plaza. A Sprint cell tower in the shape of a tree is currently on the southeast corner of the center. “Anytime you see a pretty tall structure, it is most likely a cell site,” said Paul, who is a zoning and government affairs manager for T-Mobile. Paul said the new tower will improve not just coverage for cell phone conversations but for text messages and other wireless communications. “With so many youngsters having phones … they trade photographs, they text … those data services are relying on a cell tower, too,” Paul said. You were at the Chaffey Plaza? You have to try Chef Tim’s BBQ there. If you like BBQ that place is incredible!! John Phillips, circa 1966: I used to live in New York City; everything there was dark and dirty. Outside my window was a steeple; with a clock that always said 12:30. Can’t make a cell phone call, don’t know what time it is, and half the time I don’t know what day it is either. Therefore, I feel no pressure to achieve or compete. Life is good. Hopefully the new “clock” tower will improve cellular coverage in that area. When driving up Milliken from Baseline, I can’t tell you how many times I’ve lost calls (hands-free of course). Any word if this new tower will function as an actual clock? 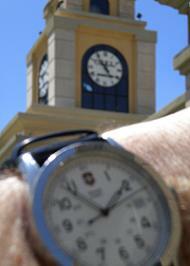 Maybe Rancho Cucamonga will achieve a 50% rating for clock accuracy.